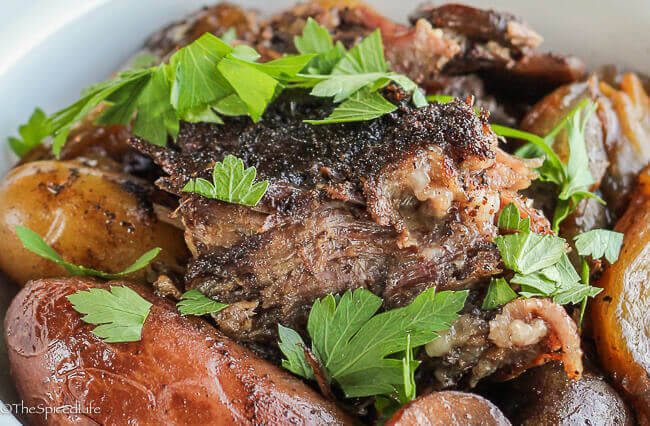 This Pot Roast with Persian Spices on Fingerling Potatoes is the perfect way to spice up your Sunday dinner routine! Luscious, flavorful, spicy but not at all hot–this is gateway food for anyone nervous of trying Middle Eastern food! Promise! Affiliate links have been used to link to items I am discussing. I mentioned a bit ago that my family bought me some wonderful goodies for my birthday, including cookbooks, leading to some awesome meals of course (the British Vegetarian Chili was one such). I loved all the cookbooks, but the one that really knocked me off my rocker is Sabrina Ghayour’s Persiana: Recipes from the Middle East & beyond . It had been on my list for a long time and holy wow if I had had any inkling how fantastic it was I would have just shelled out the cover price a long while ago. 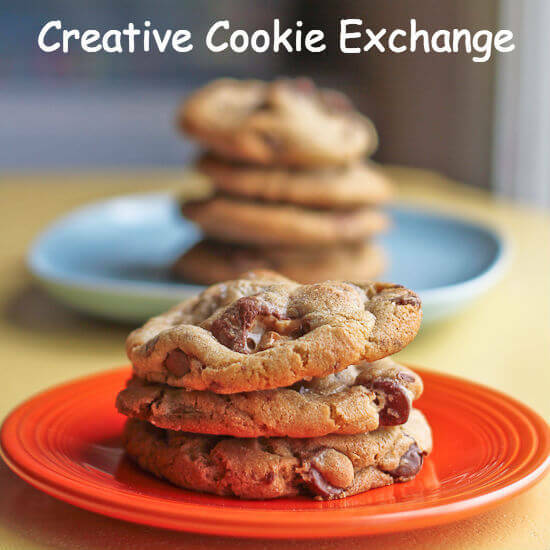 I wanted to make everything in it, instantly. Seriously. This is an awesome book. This Pot Roast with Persian Spices started with a lamb shoulder roasted in an open pan (i.e., not braised or with a lid) in Persiana. But a fatty, tough cut of meat slow-roasted, not a tenderloin, for example, which is what I think of when I think of open air roasting in the oven (versus a spit or grill). 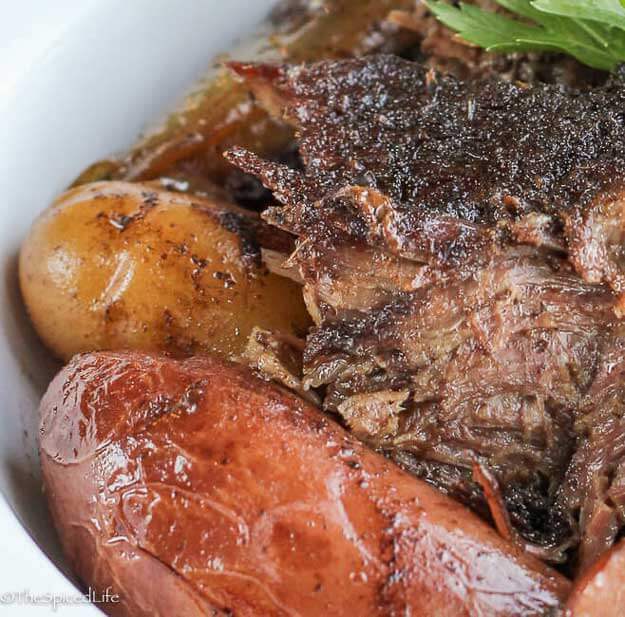 I started thinking of my mom’s pot roast, which was not a braise, i.e., no liquid was added (usually–later after I left home she started playing with it a bit), and often the pan was uncovered. We would smash the potatoes and spoon the “au jus” over them–and the au jus, not being super plentiful, was always fought over. It’s one of my favorite things that my mom makes. I don’t ever make it, because, as I’ve mentioned before, all-American un-spiced pot roast is just not John’s thing. So I usually go for internationally inspired braises instead. 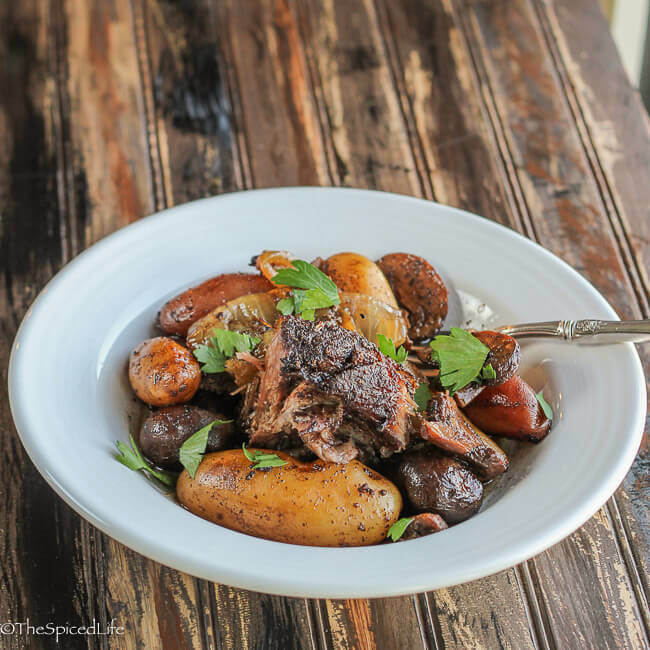 But when I saw this dry (not dry like not tasty, but dry as in without a sauce or stew) Persian spiced lamb shoulder, I immediately thought of my mom’s pot roast. Only with a lid and just a little water added because let’s face it, we don’t need any family feuding over having enough au jus to pour over our smashed fingerling potatoes! So I rubbed a beef chuck roast with a Persian spice rub based on Sabrina Ghayour’s spice rub in the book, browned it, and then piled it on tri-colored fingerling potatoes, sliced crimini mushrooms and onion wedges. It worked like a dream. Everyone loved this meal–although on an amusing side note, Alex was certain there was something wrong with the purple fingerling potatoes and never did get over it. But she happily ate the yellow and red ones! A note about the spice mix. Persiana calls for rose petals, a traditional ingredient in Persian cooking. I did not have any, and could not find my rosewater either (I thought a drop or two in the spice mix might work instead). But what I did have was a salt blend that I saw sold all over Venice, clearly aimed at tourists (but that I could not resist), mixed with dried edible flowers. It included rose, as well as calendula and some others, and did indeed have a distinct floral aroma, so I used that for both the dried rose and the salt portion of the spice rub. Because I certainly do not expect any of you to have a bag of Venetian salt I have written that portion of the recipe as the cookbook calls for. Adapted from Sabrina Ghayour. I have chosen to use beef chuck in this recipe, but a similar cut of lamb would work just fine. First make the spice blend: Place everything into a spice grinder (or coffee grinder) and grind as finely as you can get the rose petals. Rub the spice blend all over the chuck roast, onto both sides. Let it rest at room temperature for 20 minutes. When the 20 minutes is nearly up, heat the olive oil in a large Dutch oven (I used 7 qt round) over medium heat. When it is shimmering, add the roast. Brown it on all sides--it should be a nice, medium dark brown. It will get much darker while cooking. Remove the roast to a large bowl. Turn the cooktop heat off. Deglaze the pot with the cup of water, scraping to get all of the brown yumminess stuck to the pan unstuck. Place the potatoes at the bottom of the pot, with the mushrooms and onion wedges scattered around them. Place the roast on top of them--be sure to also pour all of the juices from the bowl back into the pot. Cover the pot with a heavy, tight fitting lid. Place in the oven and let cook for 4 hours (if you need 5 hours, turn the heat down to 300 F). To serve, first scoop out some potatoes, mushrooms and onions. Then place a wedge of roast on top of them, and spoon some au jus from the bottom of the pot over it all. Sprinkle with parsley if desired. Hey guys: although I have not done it with this roast (we ate it all! 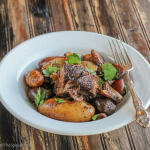 ), I bet this pot roast is a great option for turning the leftovers into a ramen bowl. I would not use coconut milk, but rather a tempered yogurt or sour cream mixture with beef stock, and focus on Persian spices, not Indian or East Asian. 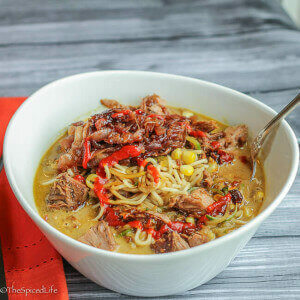 Read all about turning leftover pot roast into ramen bowls here! And here is a collage for the Pinterest lovers! Love what you did here. The charred outside and gorgeous fingerling potatoes!!! Perfect pair! O I just love all the spices and the rose! The smells must be amazing! 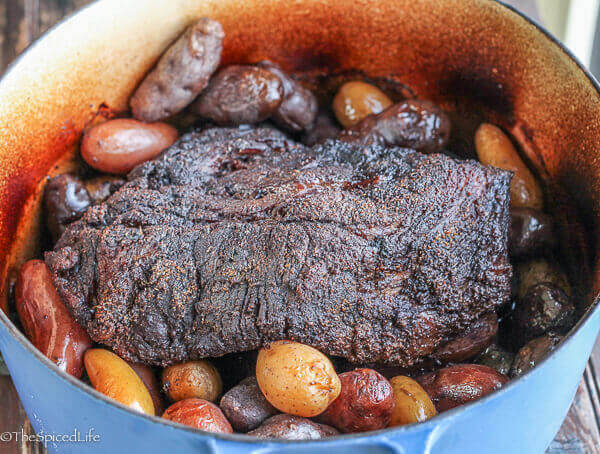 This roast looks so good! I can almost smell it, truly! Wow, does this ever look good! I finally worked with fingerling potatoes last year and they are probably my favourite! They add a lot to the dish. Looks delicious! I must try it! This was deliciously different, we love trying new flavors! I had almost everything on hand except the rose petals, so I substituted some rose water in the deglazing step instead along with a little red wine. Thanks for a real treat! Would love to try this on lamb. And the meat was so tender!